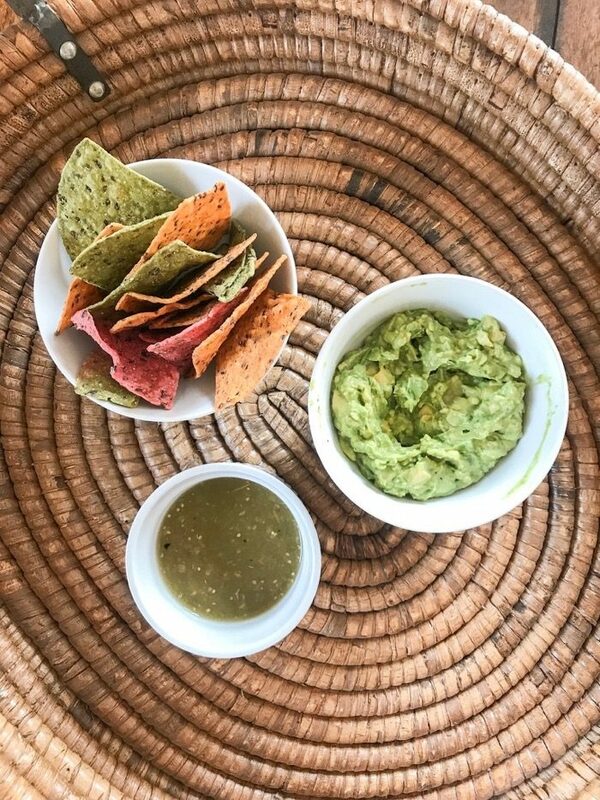 I’ve got a daily eats post to share with you today! Thank you for being here – I love that we like each other enough to keep hanging out like this (thank you!). Leave a comment when you finish reading – I love hearing from you (it’s the closest I’ll get to hanging out with you today!). Thursday morning Abby and I went for an EARLY walk with my our friend Nichole and her pup, Roody. He and Abby had a blast. Abby would not leave him alone. She was obsessed and could not leave her mouth out of his (why do puppies play with each other mouths? True question!). 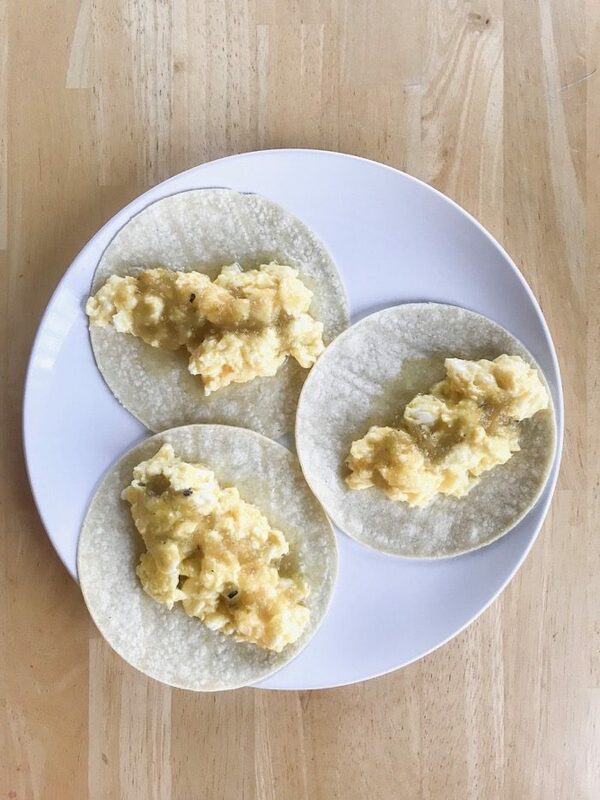 Once we got home I made breakfast (eggs, corn tortillas, tomatillo salsa and cheese), showered, and got ready for work. I had a FULL client day on Thursday. Meaning, I met with clients from 9:00 AM to 6:00 PM when I’d wrap up work. I had a great day with my clients. Today (it’s Tuesday as I write this) I have no clients and I told Marco this morning “I legit miss my clients today!”. My friends Asia and Natalie are on their way up from San Luis Obispo today and we’re going to spend the next few days together in Tahoe. Wednesday is for fun, Thursday is for co-working! This is the second time they’re visiting here since I moved. Bless them! Between sessions I made a smoothie to keep my energy going. 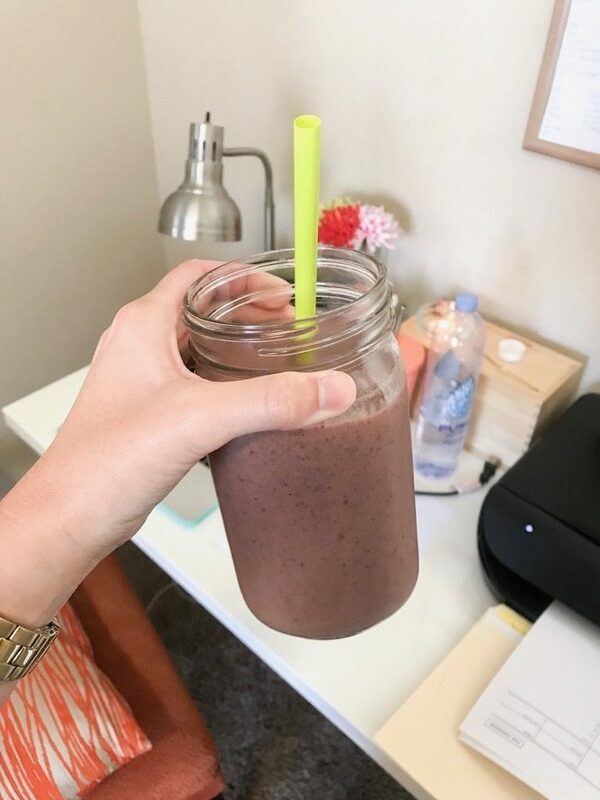 I didn’t have much time between calls and sending follow up emails (I always send my clients their action steps post-session) and this smoothie was the perfect in between. 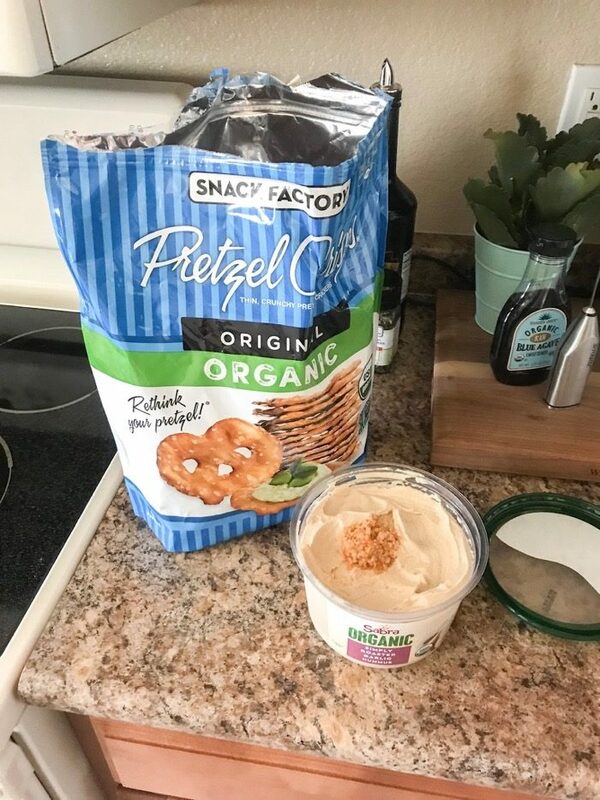 Another in between snack was these pretzel thins and this hummus that we picked up from Costco last week. Costco has the best finds! 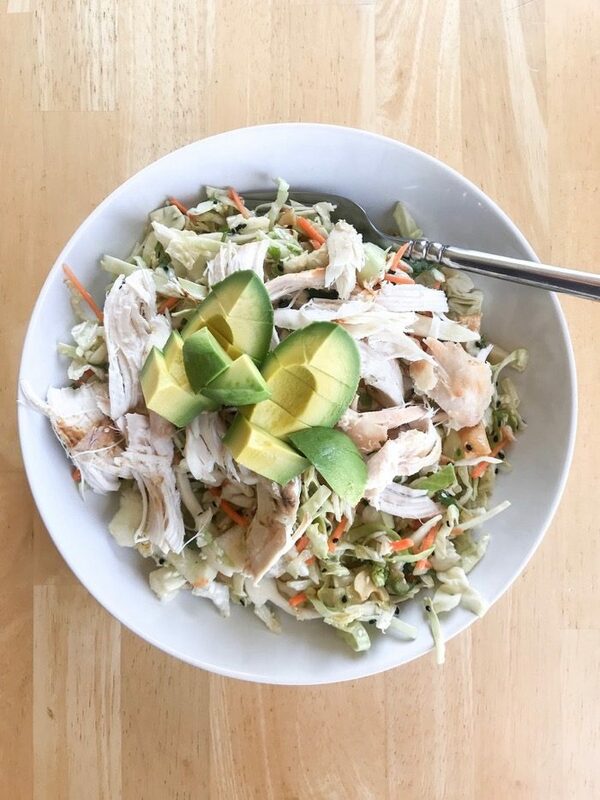 When I finally had a break to sit down for 20 minutes and have a meal, I threw together this Asian chicken salad. The Asian salad is a kit from Costco (again, praise you Costco!) 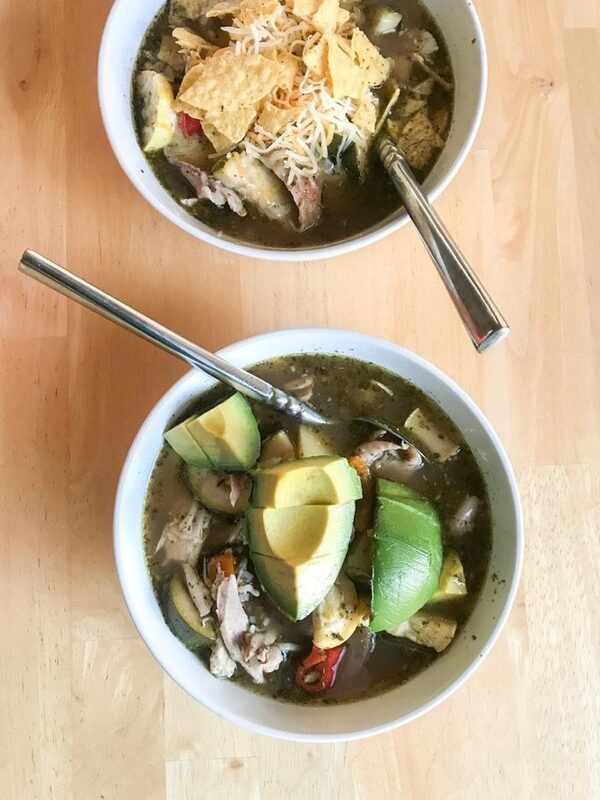 with shredded rotisserie chicken and avocado on top. 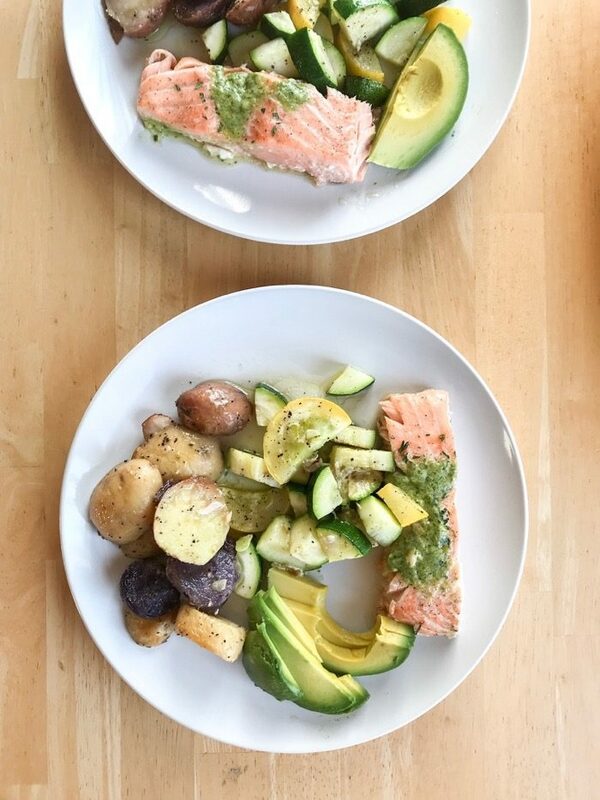 For dinner we had roasted potatoes, pesto salmon, sautéed veggies, and avocado. So good! Friday morning started off very early with sweet Abby girl. I love this photo of her so much. Whenever I take pictures of her and want her to look at the camera I make a funny noise so she’ll look at me. Hence the tilted face wondering what the heck I was doing. Haha! 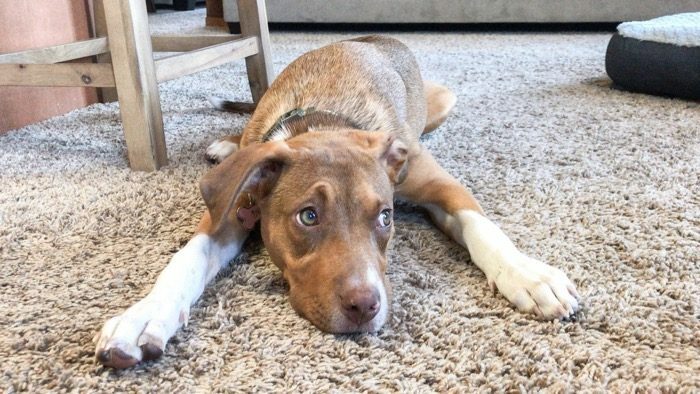 She’s either totally guilty or totally innocent in this picture. What do you think? 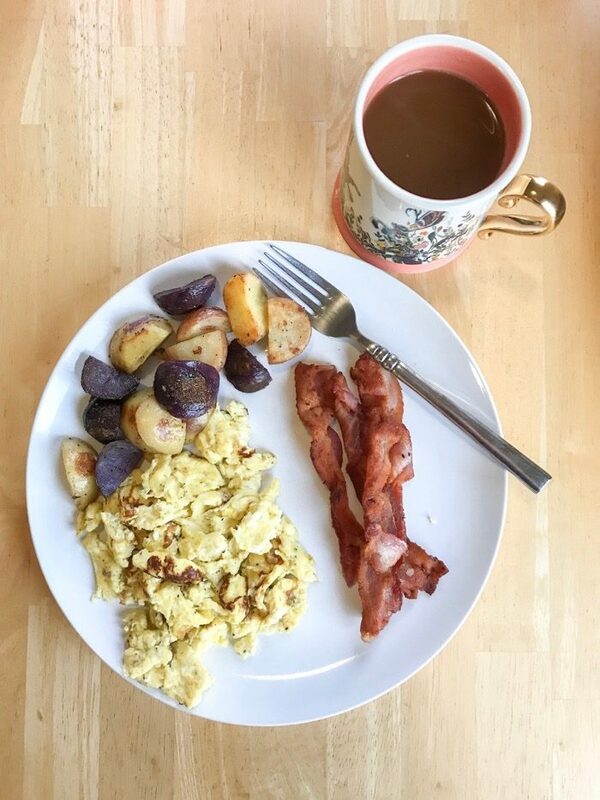 A little later on in the morning (I haven’t been wanting to eat breakfast first thing in the morning lately, I think it has to do with the summer heat) I made scrambled eggs with bacon and leftover potatoes from night before. I freaking love leftovers, they make my life so easy and delicious. After that I ran errands for a few hours. I went to the bank and deposit a chunk-o-money into my retirement account (whoop whoop!) and checked my office PO Box. When I got home I threw this salad together. 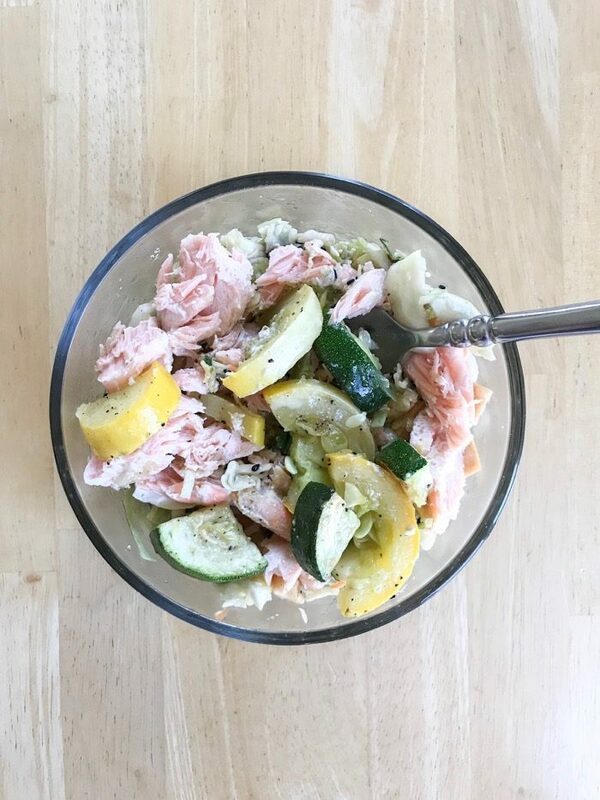 It was the leftover Asian chicken salad from the day before, with leftover pesto salmon on top. So good! 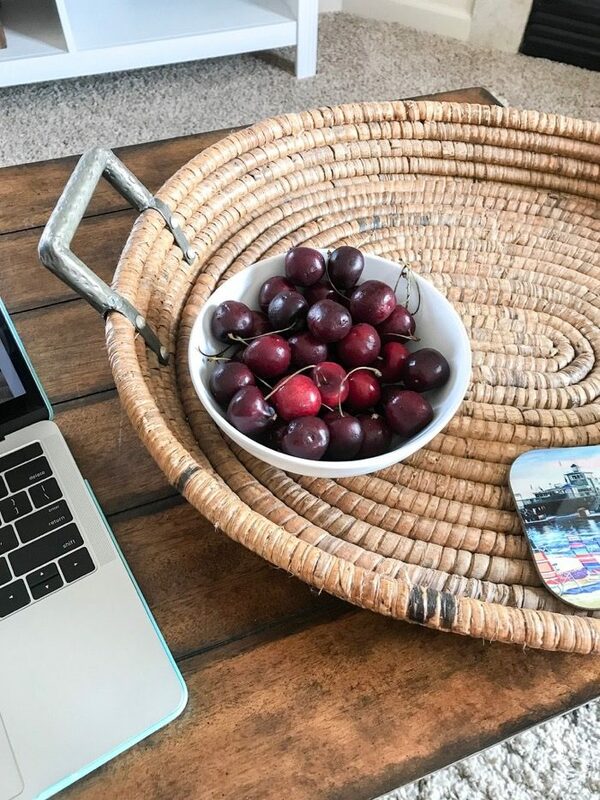 In the afternoon while I worked, I snacked on a small handful of these cherries (I keep them in this open bowl in the fridge for easy grabbing). 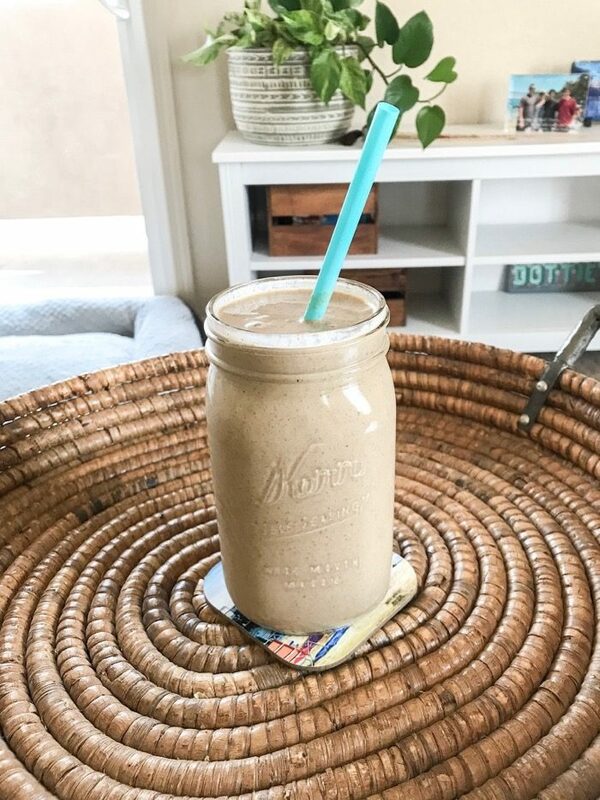 And then I made myself a green smoothie (hardly looks green, but I promise, that baby is loaded with spinach – yay magnesium, potassium, and calcium!). 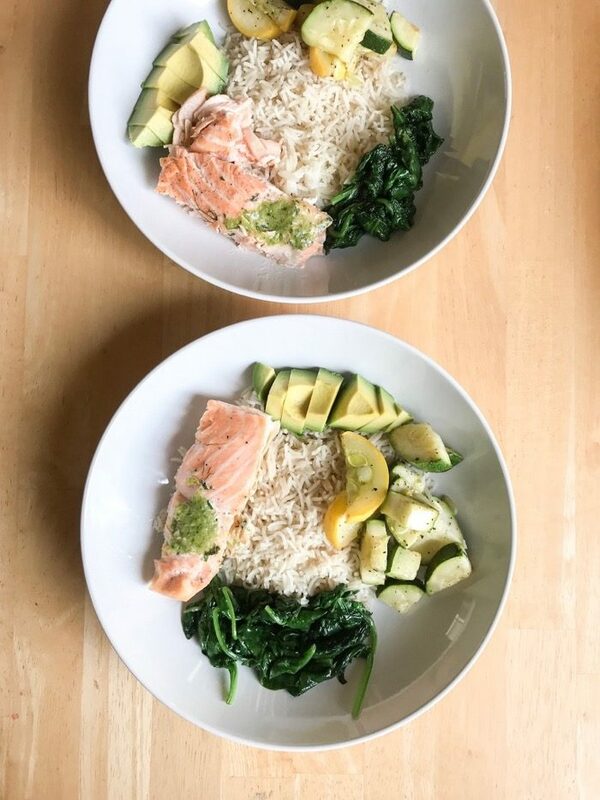 For dinner we had more leftover pesto salmon (the last of it) with fresh rice, sautéed vegetables, and sautéed spinach. I love sautéed spinach so much. Did you see the photo I posted in my Insta stories about the 45 bags of spinach? And how it shrunk down to nothing? That made me laugh so hard. It is so true! Saturday morning I woke up early and went on a hike with Abby, our friend Savannah, and her dog Texas. On my way over to her house I had some coffee and a Premier Protein drink from Costco. Again, I didn’t feel hungry at all, but knew I wanted to put some nutrition in my body before the hike. We hiked to place here in Reno called Hunter Creek. If you hike the whole thing you end up at a beautiful waterfall. But the whole thing is 6 miles up in 6 miles back. We kept it to about 4 miles total. The dogs had the best time jumping in the river together. 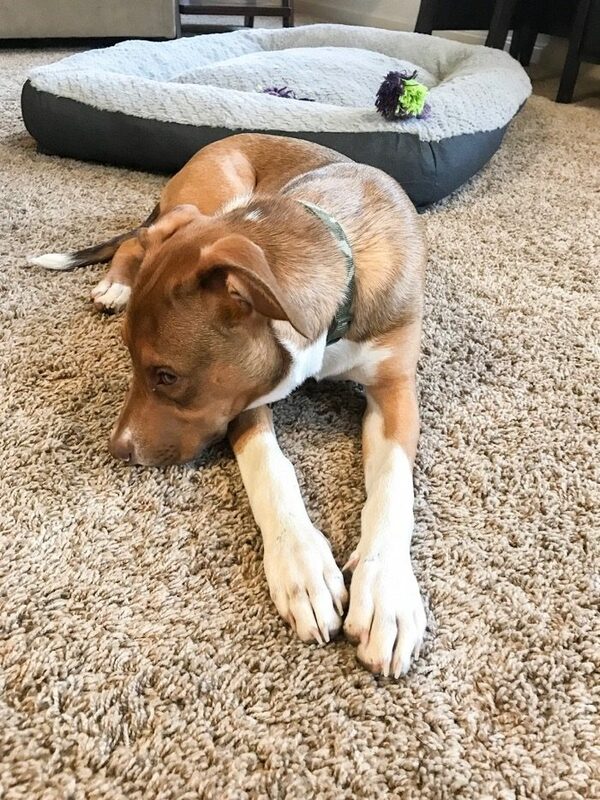 I am seriously proud dog mom! 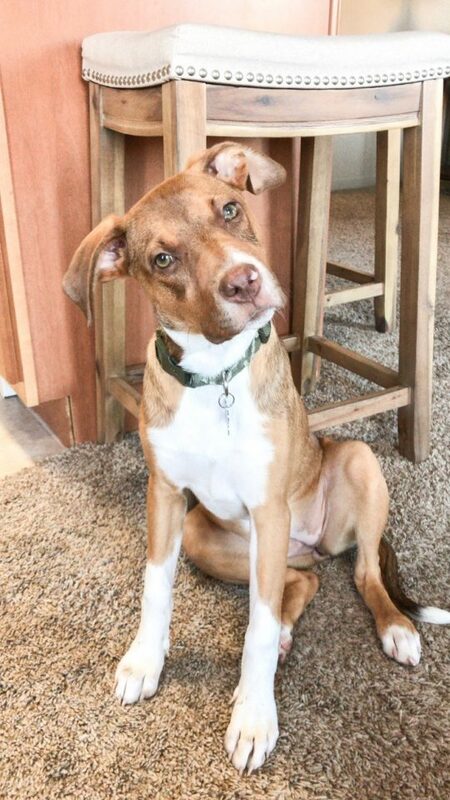 Speaking of dog mom… Do you ever wonder what happened to Noah? He is still alive and well. He actually lives in Georgia with my aunt Margie and uncle Dave (they lived in Ventura and then moved). He now has puppy siblings and lives his actual best life ever. Basically, when I moved out on my own Noah stayed with my parents. He became my dad’s best friend. When my mom was super sick it became really hard to take care of Noah as well, so my aunt offered to take him. She had always not-so-secretly wanted Noah (haha!). I am so happy for him and am extremely grateful for my family for giving him such a wonderful home. Back to Saturday… After the hike we met up with our friend Shannon and went to a breakfast place here called Peg’s. 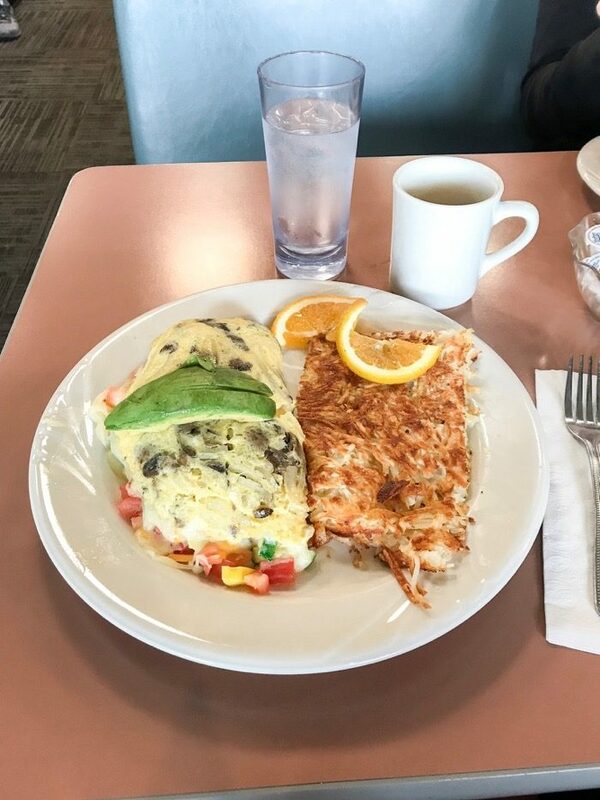 I got a veggie omelette with potatoes. I ate a little over half of this plate at the restaurant and ate the rest a few hours later, midday. A little while after that as we were hanging out at home and lounging around the house watching The Bold Type (have you seen it?!) 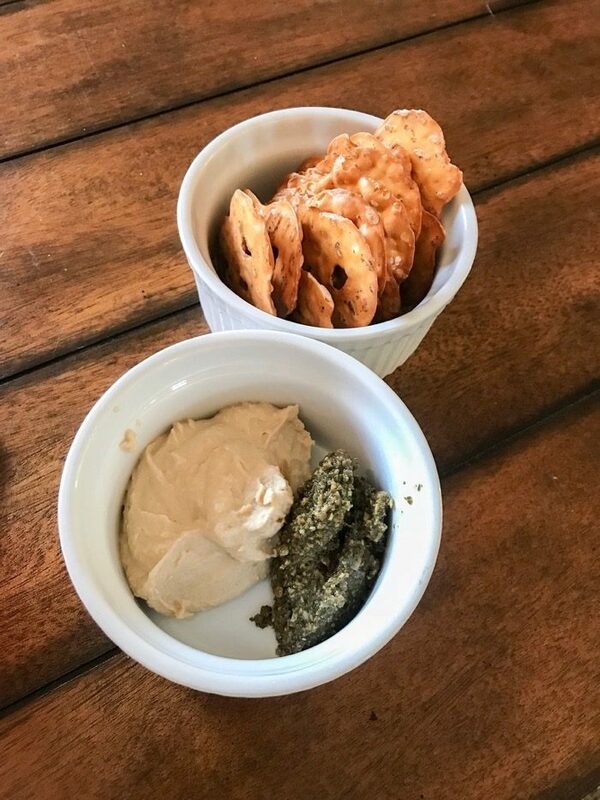 I had a snack of pretzel thins with hummus and pesto. For dinner we had homemade soup. I basically took everything that we had in the fridge and put it into a soup with a chicken bone broth. It was so good! It has fed us so many times since Saturday. 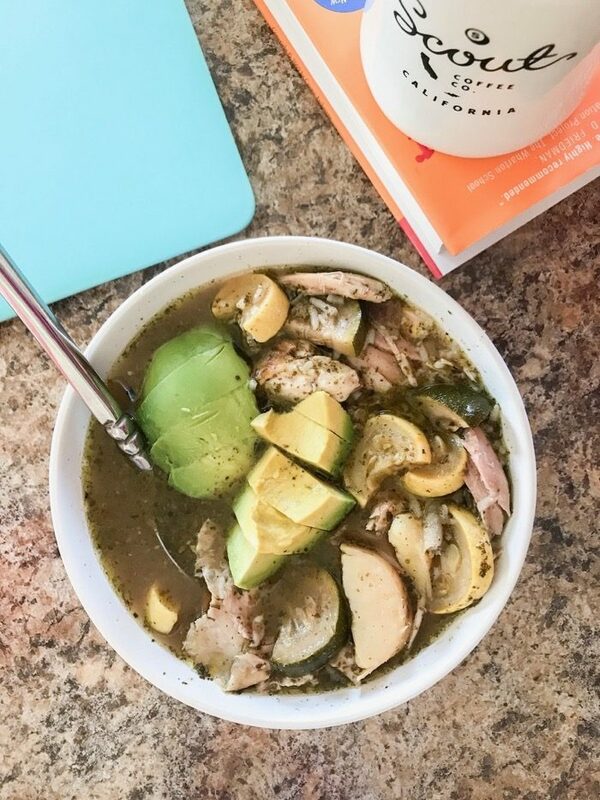 Inside the soup: rotisserie chicken, chicken bone broth, zucchini, squash, rice, potatoes, avocado (on top), pesto (seriously good in soup!) and sliced bell-pepper. Sunday I woke up and had a cozy morning at home with Abby. 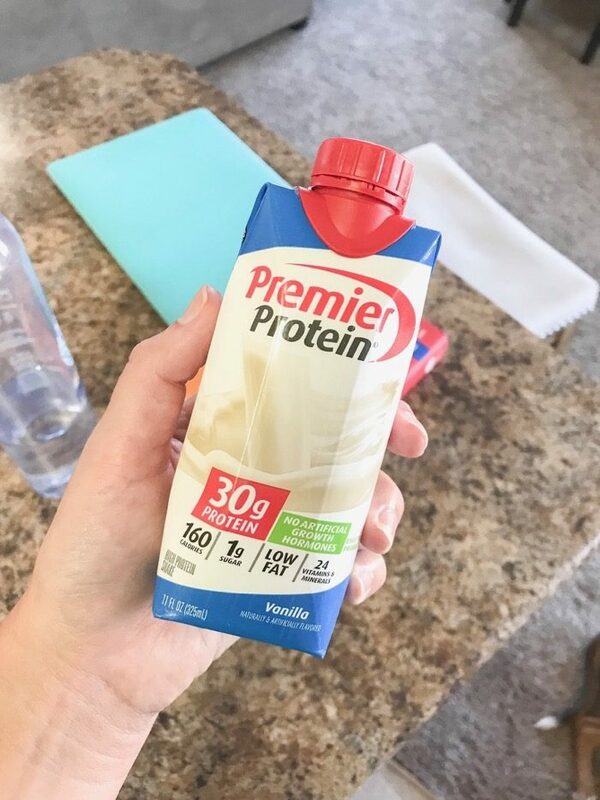 To start the day I had this vanilla protein shake and took Abby for a SUPER long walk (totally accidental how long this was – but she was happy!). When we got home I spent some time cleaning and had leftover soup for lunch. When Marco got home from work we were both hungry. He practically read my mind when he said he wanted nachos. Thank the heavens above, that’s exactly what I wanted too. 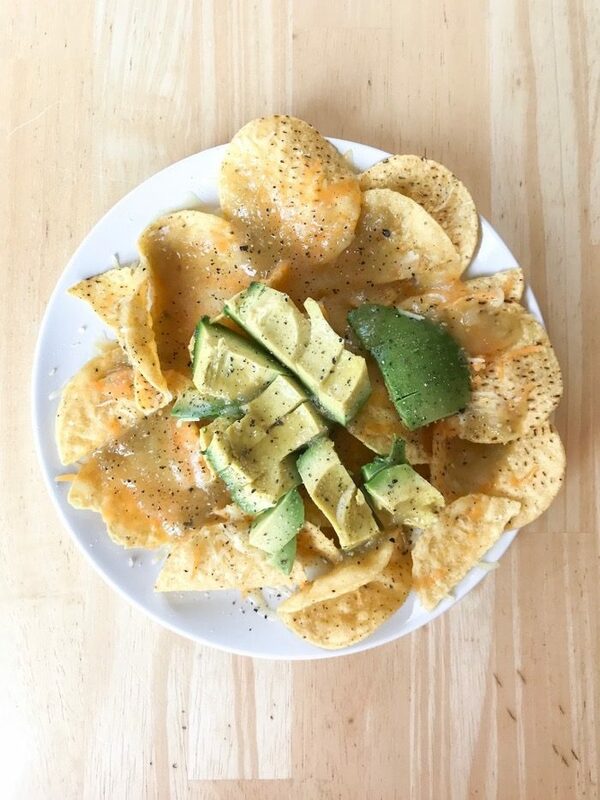 So I warmed us up some nachos and we enjoyed/relaxed. Later on the evening we went to Texas Roadhouse for dinner with friends. 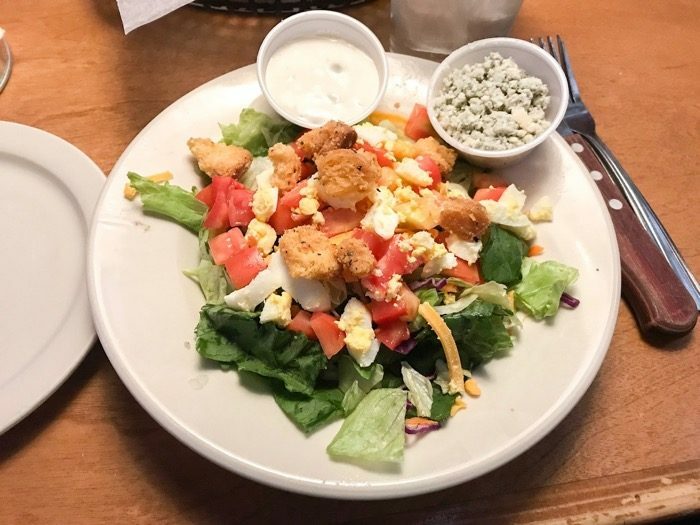 I started my dinner with a side salad and blue cheese dressing (favorite!). For my meal I got a cheeseburger and fries. 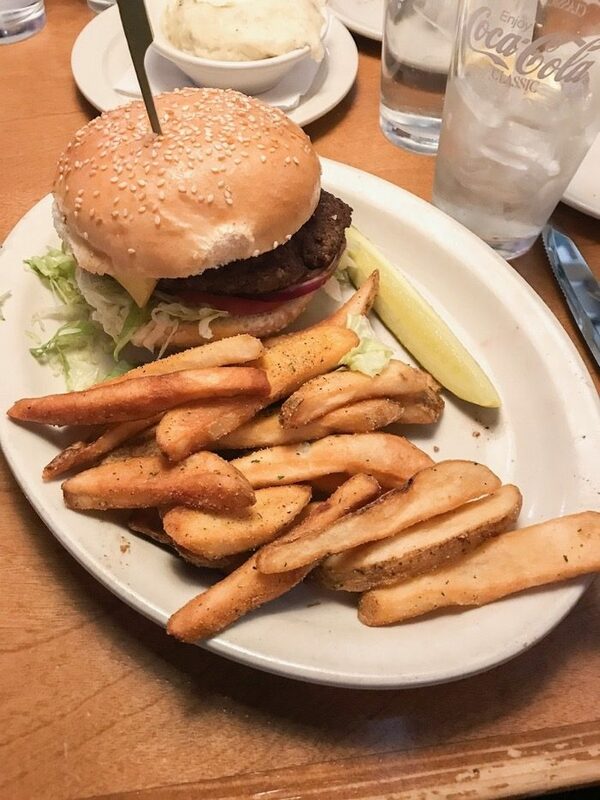 I ate some of these fries and most of my cheeseburger except for the top bun (I really wanted the meat and cheese and wasn’t hungry enough to eat the bread and fries as well). Monday was a client day. Again I woke up not feeling hungry for several hours. 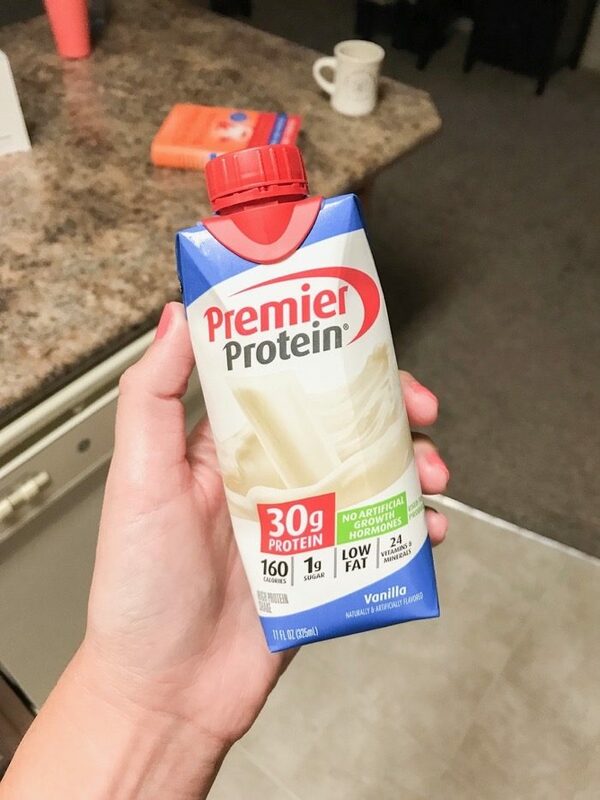 So I had a protein shake before I took Abby for her morning walk and then immediately started working with clients. 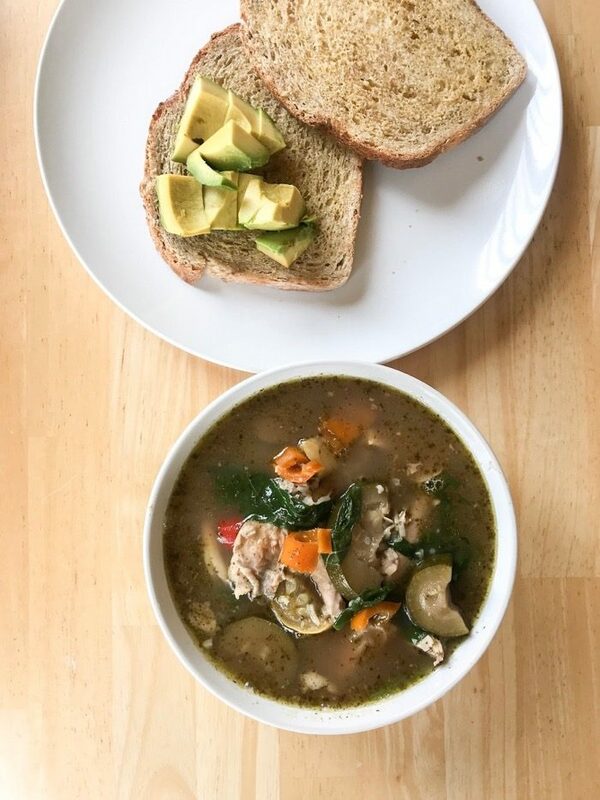 For lunch Marco and I had leftover soup heated up with garlic toast – mine topped with avocado. I had late night breakfast for dinner! 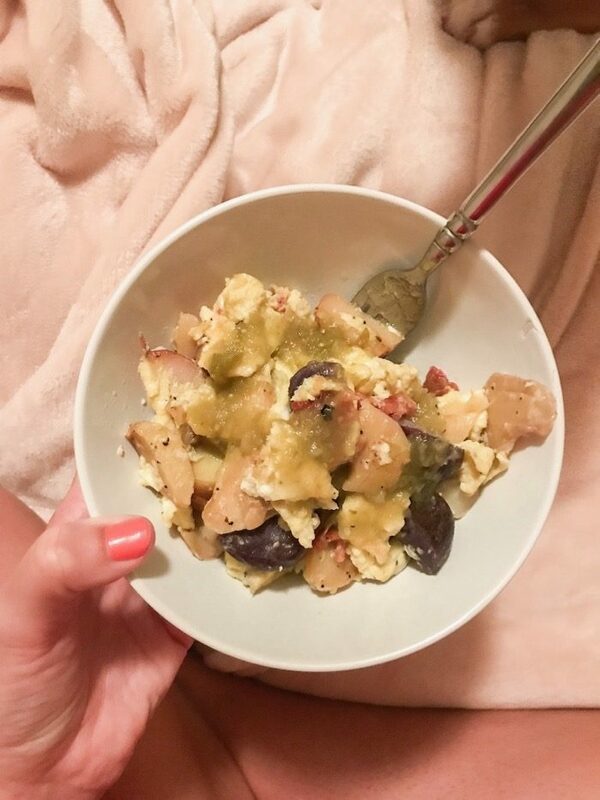 Two scrambled eggs mixed with leftover potatoes, bacon and salsa. So delicious! Abby and I took a little evening stroll before this and then relaxed in bed to watch The Bold Type (seriously who else loves this show!?). That’s it for my last five days of eats! I won’t be back again this week, but you can expect me here next Tuesday. What would you like to see on the blog next? Feel free to leave a request in the comments!